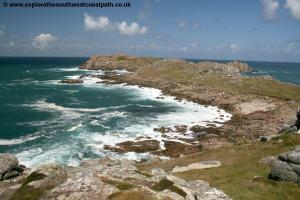 Bryher is one of the smaller of the inhabited islands and is an island of many contrasts. 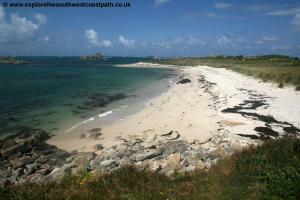 It's east coast overlooks the sheltered narrow straight to Tresco (which can be walked on particularly low tides), with beautiful beaches backed by dunes. 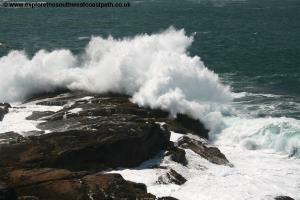 To the west however, Hell Bay takes the full force of the Atlantic, with a more rugged and rocky coastline and large waves. The town on the island has a shop and a pub. 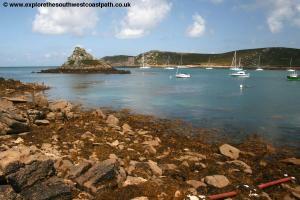 Bryher is served by boats most days from St Mary's Quay. The depareture and return times can vary, due to the tides but are normally out to the island at between 10 and 10:30am with a at least one return trip between 2 and 5pm. The quay nearest the town is used when possible but at low tide the boats depart from Annekas' Quay a little to the north of the town. 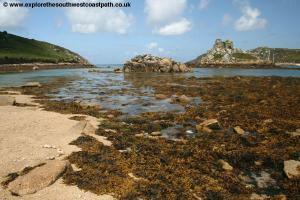 As it's a small island, Bryher has a limited range of accommodation. The only hotel on the island is The Hell Bay Hotel on the west coast of the island. 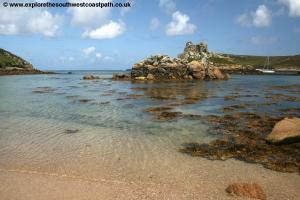 There is also a holiday cottage, Bank Cottage Bryher and a campsite, Bryher Campsite. This walk begins from the main quay (Church Quay). 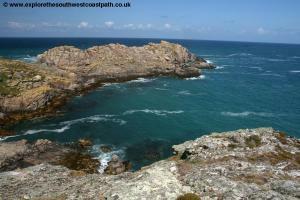 However depending on the tidal conditions you may be dropped instead at Anneka's Quay which is a little further north. 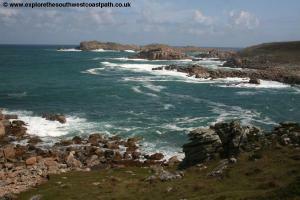 However since this is a circular walk it doesn't matter too much. 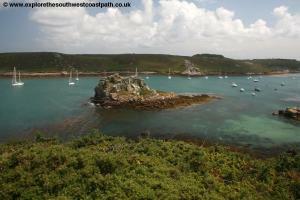 Just be careful to check which pier the return boat goes from unless that is your staying on the island of course. 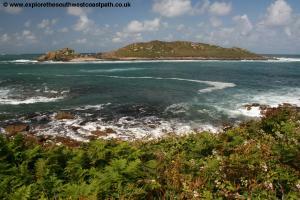 The walk goes clockwise around the island. From the main quay follow the footpath side of the quay (on the left, separated by railings) and at the end of the quay you should see an information board that at the time of writing (July 2011) also had a rack for a free map of the island which is worth picking up. 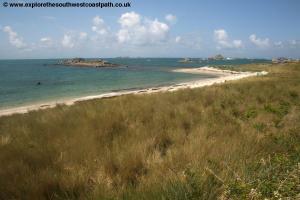 Now turn left along the path that heads south west alongside the lovely beach of Green Bay to your left. 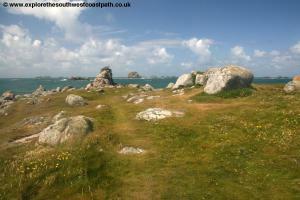 The path follows along the edge of some fields but soon turns to the right away from the coast. Continue on this track as it turns right and then back left, soon passing to the left of a house. Keep on the main path ahead until you come to a junction ahead where you turn left on the footpath down to Veronica Farm. Continue on this path until you reach the coast of Green Bay once more where you keep to the main track going south along the back of the beach. 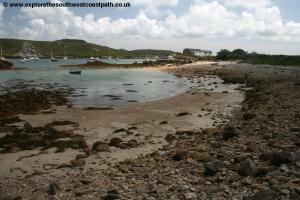 You'll often find boats moored on this attractive beach and ahead you come to a little slipway for the boats with a 'boat park' on the left. 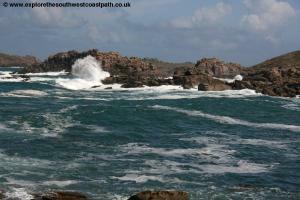 Your now heading to the more wild south coast rounding the little headland of Samson Hill. Keep on the path ahead at a low level just next to the beach. 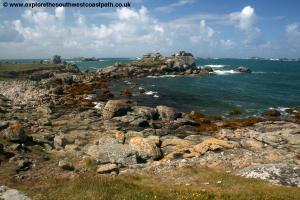 A path goes off to the right climbing to the top of the hill (which offers good views), but keep ahead on the main lower level coast path. 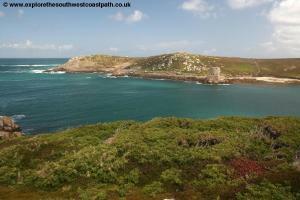 This soon reaches the southern most point of the island where you have fine views over neighbouring Samson. 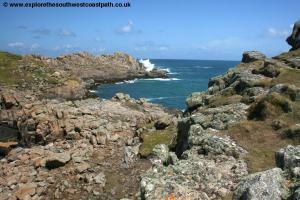 Another little path climbs to the left to the rocky little outcrop you can see but keep to the lower level coast path. This brings you round to another beautiful beach, Rushy Bay. This, like many of the beaches on the islands, is best appreciate at high tide where the shallow see is a lovely colour and the rocks mostly hidden. At low tide the seaweed covered rocks are a little less attractive. 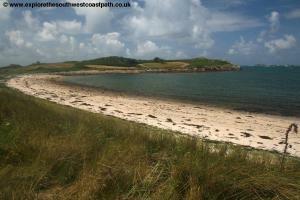 The beach here is backed by a dune system and the path goes round the back of this. Ignore a track going left-to-right and continue on the path along the back of the dune. Soon another wide track joins going left-to-right but ignore this and continue on the smaller footpath straight ahead with the beach just to your left. 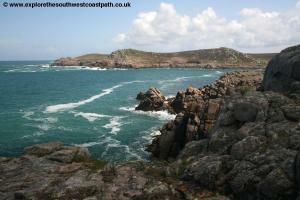 Before you come to some more rocky outcrops ahead turn left on the main path just behind the beach. We are now on an area known as Heathy Hill (for obvious reasons!) and you head right to the end of this little peninsula. 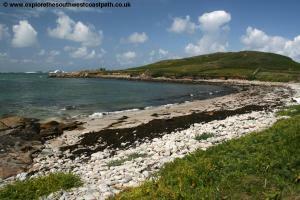 Follow the coastal path around and as you round onto the north side of this little peninsula the path enters a field. To leave this you leave through the gate midway along the field ahead rather than right alongside the coast. 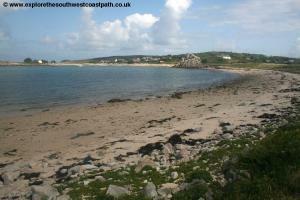 Continue through the next field and then back to the coast now at another fine beach, Great Porth. Like many beaches on the islands this is a fine sandy beach with small rocks at low tide and backed by a mixture of dunes and grass. 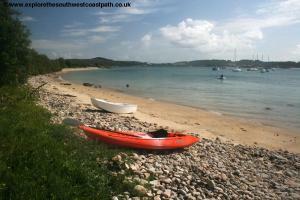 Take the path along the back of the beach, or along the beach itself if you prefer. 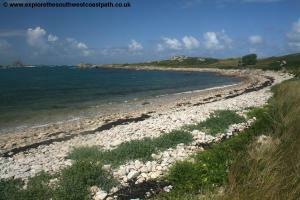 As you near the north end of the beach the path widens to a track passing some of the houses on the right. Near the Hell Bay Hotel on the right the path splits, with the left most fork going to a couple of houses. Don't take this but take the right of the two forks heading behind the houses and round to another little beach with the rather unfortunate name of Stinking Porth. 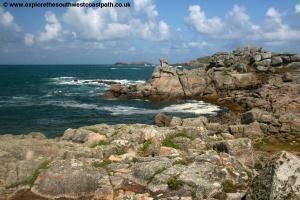 Stinking Porth is another small and attractive beach and behind it is a small lake. 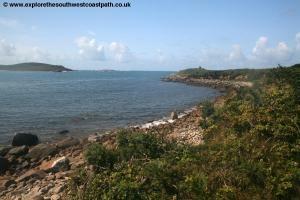 As you round the bay the path splits, with a path to the left going to the top of Gweal Hill. 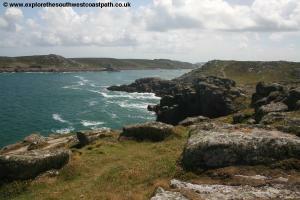 Ignore this and instead take the coast path around Gweal Hill. This hill almost forms an island and it is topped by some rocky outcrops. Just off this little peninsula is the island of Gweal, one of the many uninhabited islands that make up the Sillies. If you are very careful and it is low tide it is possible to wade out to Gweal, but it is not recommended and if you do so, be careful not to get cut off by the tide. 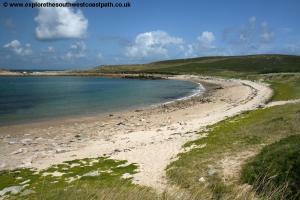 Once round Gweal Hill you come to another sheltered little beach which forms almost a complete circle, Popplestone Neck. 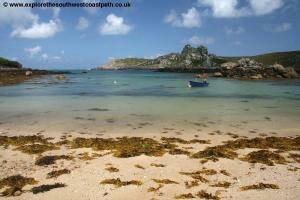 This is another fine beach with white sand which offers fine views to Gweal. 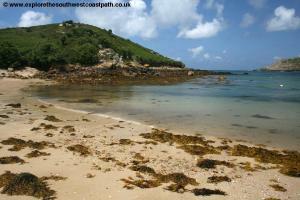 Follow the path along the back of this beach and continue along the wide path as the island becomes more rocky ahead. You pass Great High Rock off to the left and then come into Hell Bay. The bay is so called due to often furious state of the sea which is now the open Atlantic, with nothing between here and America. 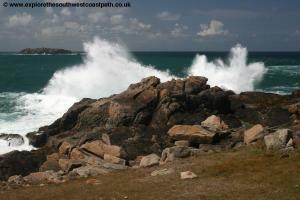 The sea can be spectacular here, splashing up over the rocks and it is well worth stopping to watch the spectacle. 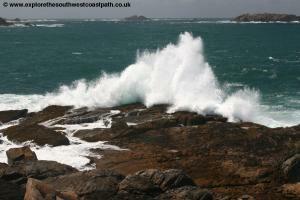 Continue alongside Hell Bay up to the northern tip, Shipman Head. Part way along here the path doubles back round the east side of the headland, although you can if you choose walk a little further out to the end of the headland. 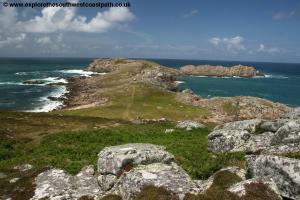 Note that the far tip, Shipman Head itself is in fact an island for much of the time, separated by a narrow (and often fast-flowing) strip of water so don't try to cross this. 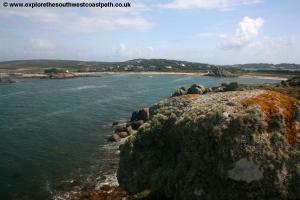 Once you have taken in the views of Hell Bay round the corner and almost immediately you can see the difference! 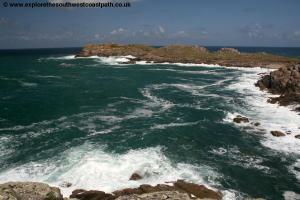 The sea is no calm, looking over the narrow channel between Bryher and Tresco and the cliff tops are covered with bracken. 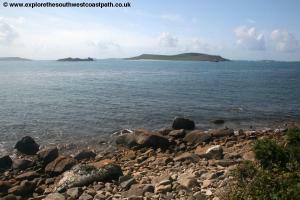 Continue on the high level path with views over to Hangman Island to the left. 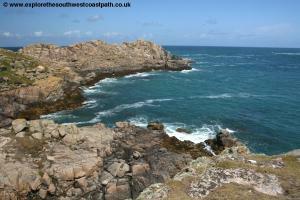 When you come to a rocky area where the path ahead turns a little way from the coast, follow it, turning slightly to the right away from the coast and descending down to fields. 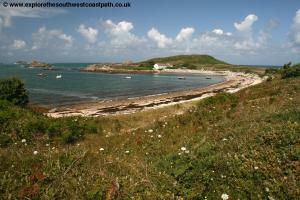 Part of these fields make up the Bryher camp-site and you follow the track along the eastern edge of the camp-site down to the islands only pub and cafÃ©, the Fraggle Rock Inn. 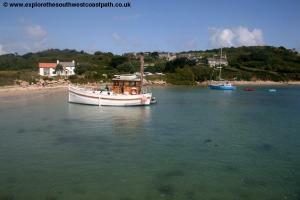 Pass in front of the pub and follow the main track south passing a couple of houses and soon reaching the boat yard. At the boat yard you turn left and take the path through the boat yard. This leads back to the beach and here you'll find Annekas' Quay, (also called the Bar), where boats to the other islands leave when the tide is low. 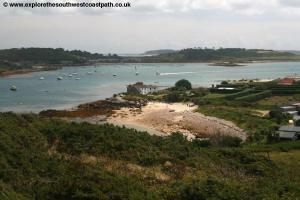 From here you can return to the town quay either by walking along the lovely beach or the main track through the village. If you pass through the village keep with the track as it turns left and when it splits, turn left following the track down to the church, quay and toilets. This is a circular walk, but it is common to have to depart from a different place from where you arrived. If the tide is low you are likely to have to return from the Bar otherwise you'll return from the Quay unless of course you are staying on the island. 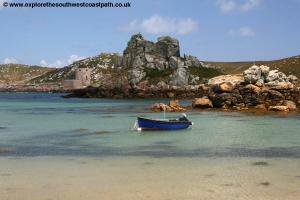 Hopefully the boatmen on your outward journey will have told you when and where the return boat goes from!